It is the end of another year and the start of a new one that offers endless promise to be better than the previous and a chance to leave behind all the baggage that was 2015. So in the sprit of a new start I took to the streets as I normally do every new years to try and capture the sprit of new years as I go about mine. I have broken it up into three parts the first is the build up of people around the Sydney CBD, what I got up to new years night and finally New years day. 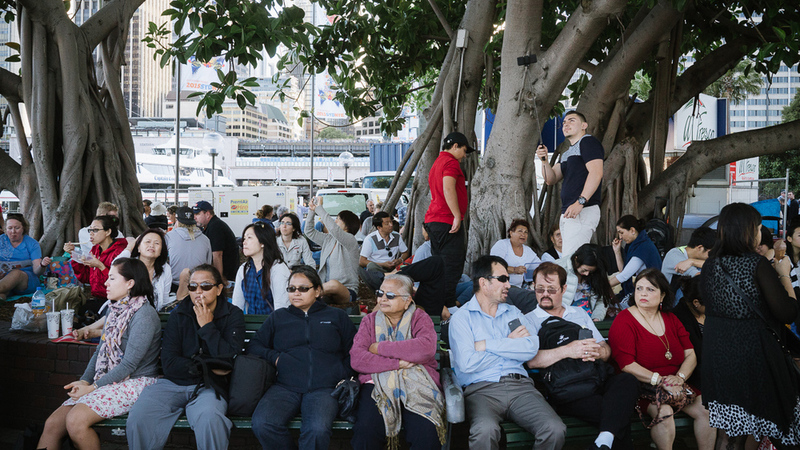 It pays to be early to get a bench at Circular Quay. Circular Quay is one of the popular locations as such it fills quickly so you need to bring something with you till fill the time till the fireworks. Garden beds are fair game as far as vantage points go on New Years. New years eve night is like one giant brithday party where every one is the birthday boy or girl. Over the years I have done the Fireworks, stalking the city streets trying to get that one magical shot that sums up new years and of course I have done that lonely night at home on your own. This year it was about board games and food at a friends place in Stanmore. So after running around the city trying to grab some shots I had to quickly duck into the closest supermarket which happens to also be close to circular quay and let me say the bottle shop was full to the brim and a lot of the shelves in the super market were empty. I had intended to only stay till about 11pm then head back into the city to grab some black and white flash shots as they headed home after the fireworks as I have in the past. But the company and the games were just too much fun to pass up. It is always fun hanging out with actors and creative types though it was a little annoying to lose Settlers by one point to the only engineer at the party. Watching the fireworks via a live stream on your phones. What a world we live in. For the majority of the population they will only see a couple of sun rises in their lives and the most likely one is that of New Years day. This is the second year I have gone down to Coogee for sunrise as most other photographers would think about going to Bondi. This year it was rather cool over night (18C) so there were not as many people about and even fewer in the water than last year. Even so it was interesting seeing what every was doing to bring in the new year. By this stage of course I was ready for a quick nap before heading to Bondi for sunset. People gather at the waters edge for selfies at sunrise. 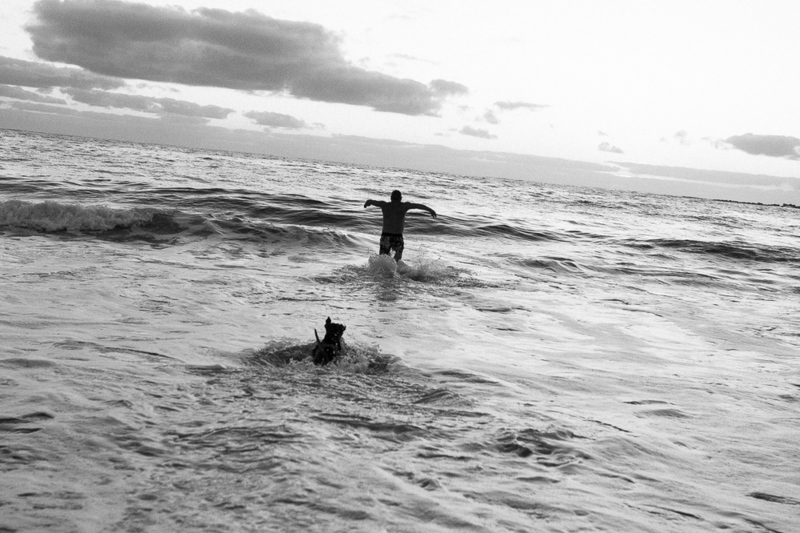 Coogee local goes for his daily swim with his Dog. A childs chalk drawing of the Coogee new yearss Fireworks. What remains of a new years eve party. New Years Day turned out to be a good beach day. The Historical entrance to the Coogee Baths at the north end of the beach. Swimming at the North end of Coogee beach. New years day puts a big strain on public transport as more people want to get to the beach, but there are less services. Just kicking the ball around a circle with some mates. Hunting for little fish and crabs under the supervision of grandma. In the past New Years day can bring up to $100 in lost lose coins this year he got less than half that. Here he found a $1 coin that was 15cm under the surface. The work of town young men and 20min of work. After shooting so much after the past 48 hours and feeling in a daze I find the scene at Central station. It did not even cross my mind to get my camera up to my eye and I only got it on ym phone something that I regret now.